Benjamin’s father, Kevin, is organizing a drive to collect small items for the Ronald McDonald House wish list, and plans to deliver them on Ben’s birthday, August 6th. Many things on the list are easy to obtain and donate, such as toiletries. So many of our friends and family made generous monetary donations in Ben’s name after his death, and the last thing we want to do is ask people for more money – so this effort is meant to be more symbolic, minimally financially taxing, and as noted, an opportunity to do something we can feel very good about on his birthday. The Town of Marana and Northwest Fire Department are serving as major participants in the drive. To view the Ronald McDonald House Wish List, arrange for donation pick-up, or to learn the location of drop-off points, click here. 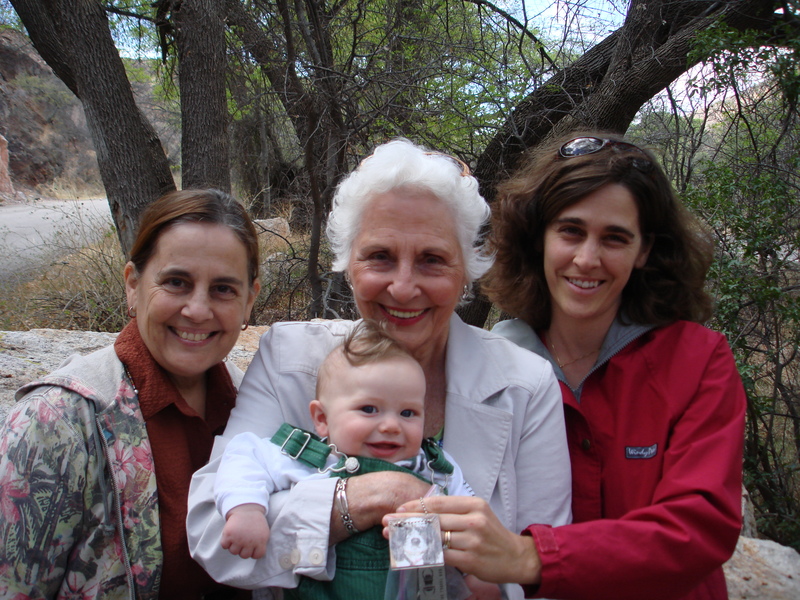 Ben's family, including his grandparents and intrepid great-grandmother, introduced the first "Benjamin's Bug" into geocache circulation on March 24th, 2007. 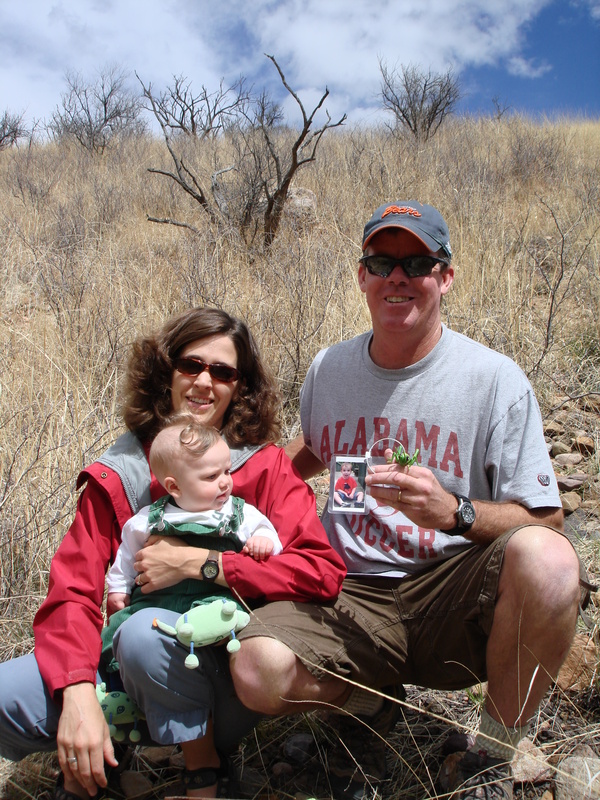 The bug was an "Intrepid Insect," a grasshopper to be exact, and was placed into the Clark Box cache in Patagonia, along the Arizona Trail. Placement required traipsing through chest-high grass and battling with a plethora of rather persnickety ants on the trail. Because our formal TravelBugs had not arrived yet, the insect placed has informal tags, and will rely on geocachers to track it using its own identification number through this website or through their notes on www.geocaching.com. We'll see if it works...Bon Voyage, Grasshopper! Four generations of "Benjamin's Bugs"
The American Cancer Society's Relay For Life took place overnight from April 27th to 28th in Oro Valley, Arizona. The Town of Marana's two relay teams raised funds this year in Benjamin's name. 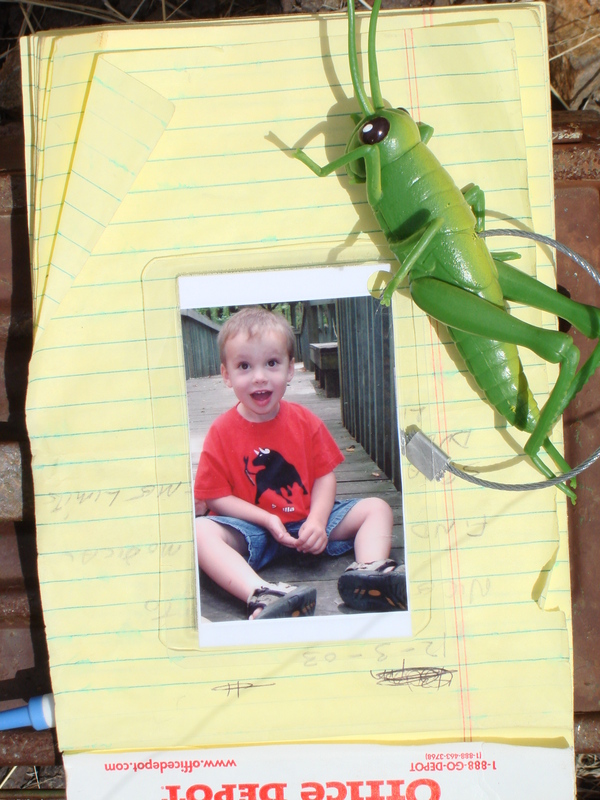 Ben's parents, both sets of grandparents, and cousins attended the event, and the family set up a tribute table highlighting Ben's curious spirit and the family's efforts to remember him through geocaching. The relay track was lined with luminarias dedicated to those lost to cancer (as well as survivors and current fighters), and the Town of Marana was kind enough to creatively decorate two for Ben. The event was emotionally difficult for family, but we were sincerely touched by the Town's efforts in Ben's memory. And a slow walk through the path of tribute luminarias served as a poignant reminder of the strength of human bonding and the inevitable pain of loss. Our family is acutely grieving our loss of Ben. We find we grieve less painfully, and possibly more productively, when we get out of the house and get moving. It is what we would have been doing if Ben were still with us in body, because he would have insisted upon it. Now when we explore new areas or revisit favorite ones, we choose to believe Ben joins us in spirit, and that we continue to nurture his spirit of adventure as we nurture our own, and as we nurture Ben's infant brother by introducing him to this beautiful natural world. Our efforts to grieve, nurture, and rebuild our lives will be shared via our Family Blog, which is intended for family and friends but may be viewed by all. Visit by clicking here.